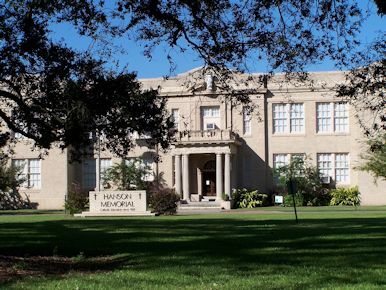 Hanson Memorial High School opened its doors to the youth of Franklin in 1925. It is to the generosity of the late Minnie Hanson Conolly that the people of Franklin are indebted for the school presented to them in memory of her father, Albert Hanson, and her brother, Eddie Hanson. In 1931, Mrs. Conolly established an endowment fund that would help to keep tuition at a minimum. The addition of a library and cafeteria building occurred in the early fifties, and the construction of a gym/science structure took place in 1962. In 1999, a building housing the Jr. High department was completed. The late Mrs. J.C. Blevins continued the work begun by her generous aunt and today the Blevins-Kemper descendants carry on the family's dedication to Catholic education and Hanson Memorial High School. In the spring of 1967, the Christian Brothers, after forty years of dedicated work in the education of boys in Franklin, withdrew from the faculty at Hanson because of a greater need in other areas of the Province. In August, 1967, St. John Academy and Hanson Memorial High School were consolidated and Hanson opened its doors as a junior and senior co-educational high school. 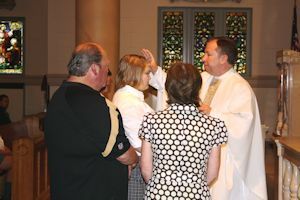 The Marianites of Holy Cross, who had been at St. John since 1871, agreed to become a part of Hanson's staff as well. With this restructuring, a new era in Catholic education in Franklin was begun and has proved to be an important and valuable part of the community. The school is presently staffed by dedicated lay men and women. In 1871, Archbishop Perche of New Orleans, visited Franklin and saw the need for providing a means of education for the youth of Franklin. Upon his return to New Orleans, the Archbishop contacted the Marianite Sisters of Holy Cross, asking them to take charge of a mission here. On October 31, 1871, five Marianite Sisters arrived in Franklin. On November 4, 1871, a beautiful ceremony was held in the convent yard and the pastor of the Church of the Assumption, Father Rouxel blessed the school and convent. The institution was placed under the guidance of St. John the Evangelist, and called the Academy of St. John. The school survived despite many disasters which included two great floods, several terrible storms, yellow fever epidemics, and two fires. In 1907, a wing was added to the Academy, the chapel in the convent was renovated and enlarged, and an elementary building was erected. Later, to accommodate the many boarders seeking a refined education at St. John, a third story was added and many other improvements were made. In approximately 1944, the Cooperative Club and parents of the students began raising funds toward the construction of a new school building. In September 1950, the new modern school for St. John Academy opened its doors. A house was moved behind the convent and renovated to become a cafeteria for the students. In 1961, a newly constructed convent, a new home for the sisters, was dedicated and the sisters moved into it.In 1965, a new cafeteria was built. 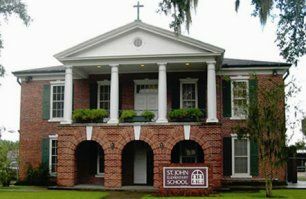 The class of 1967 was the last all-girl class to graduate from St. John Academy. In September 1967, grades seven through twelve were transferred to Hanson High School and St. John Academy became known as St. John Elementary School. This was a result of the Christian Brothers leaving Franklin, and it was also a financial move by reducing the cost of operating two separate high schools. The sixth grade was moved to Hanson in 1986. At this time, St. John added a preschool and the first lay principal was hired. The end of an era occurred in 1991 when the Marianite Sisters elected to leave St. John Elementary. The Sisters had touched many lives throughout the years and their departure was accompanied by much heavy-heartedness felt by the people of Franklin. In 1996, St. John celebrated its 125th year anniversary. Because of the sacrifices and dedication of many members of the clergy, religious, teachers, parents, benefactors, and friends, St. John is still providing a Catholic education to the people of Franklin. The school has played a major role in the history of the town of Franklin. It is an institution that is looked upon with pride. St. John and Hanson Schools are under the supervision of the Church of the Assumption School Board. Meetings are held on the third Monday of each month.